As New York Yankees outfielder Ichiro Suzuki rounded first for what was his 4,000th professional hit Wednesday evening, somewhere in the distance was the fading voice of the oft-forgotten Arnold “Jigger” Statz. For most, the name will not be familiar, as the bulk of his playing career came in the Pacific Coast League, far away from the lights of the east coast media. Duke Snider, the Brooklyn Dodgers Hall of Fame center fielder, grew up watching Statz impress the Los Angeles crowds. Speaking with the late Snider’s friend, New York Yankees outfielder Irv Noren in 2012, he related a story of how Snider surprised the New York media when asked who the best center fielder was among himself, Mickey Mantle, and Willie Mays. 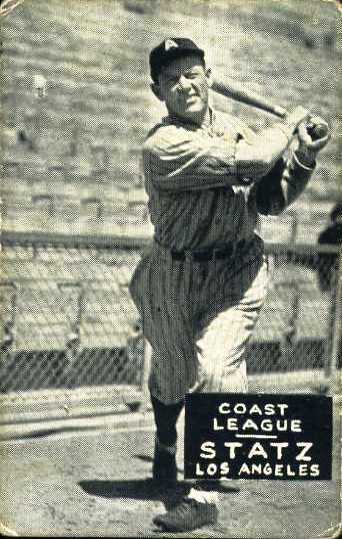 Statz played professionally 24 years from 1919-1942, amassing 4,093 career hits between the major and minor leagues. By the time he played his last game, his career combined hit totals placed him second all-time, only behind Ty Cobb. I first encountered Statz’s legend in Jason Aronoff’s “Going, Going, Caught …,” a wonderful book about the greatest defensive outfield efforts largely in the era that pre-dated national television and smaller ballparks. Using multiple news sources to reconstruct his highlight reel catches, Aronoff used ten pages to paint Statz as one of the greatest outfielders of the 1920s. Aronoff chose a telling quotation from Baseball Digest’s Al Wolf, whose 1966 article, “Statz, ‘Best’ Center Fielder, Played in Record 3,373 Tilts,” aptly rated Statz defensively above the greatest center fielders in the game. Statz played for four teams in the major leagues from 1919-1928, with his best season coming in 1923 with the Chicago Cubs when he batted .319 with 209 hits. He finished his major league career at age 30 with 737 hits, but was far from done. Starting fresh with the Los Angeles Angels of the Pacific Coast League, he reeled off eight consecutive seasons of over 200 hits from 1929-1936, and at age 40 in 1938, he piled on another 200 hit season to silence his doubters. Lennie Merullo, the 96-year-old former shortstop for the Chicago Cubs is one of the few living major leaguers that played with this unheralded outfielder. Speaking with Merullo via telephone in 2009, he said playing with Statz as a member of the Angels in 1941 was one of the most cherished memories of his career. “He was a legend,” Merullo said. “The word 'jigger,' you associate it with Jigger Statz. He was a good hitter! He meant one thing, one of the greatest center fielders that ever lived! He must have been something to play with at the time because I never forgot him."